Itâ€™s Monday once again, and I move into yet another hectic week. Last week had been crazy anyways. A colleague of mine who handled a couple of clients quit a while back and we are yet to find a replacement for him. So in addition to the set of clients I already handle, I have to take on a few more to keep the business running and this has stretched my servicing abilities to the maximum. 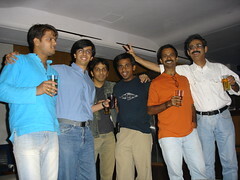 In all this work pressure I did manage to have a great Holi celebration with close friends. That evening we also happened to watch a very skipable movie â€œMaalamaal Weekyâ€ â€“ If you really donâ€™t know what else to watch in the theater hall, only then should you bother watching this movie. And of course letâ€™s not forget before Holi, we had a celebration party @ work for the numerous projects we have completed successfully in the first 2 months of this year. I was proud to be the account head for two of the major projects completed.